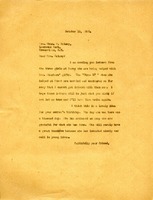 Martha Berry writes to inform Mrs. Halsey that she is sending letters from three girls who are being helped with Mrs. Halsey's mother, Mrs. Chambers', gift. The previous "Three Ls" were married and scattered far away, so three new girls' letters were sent. Mrs. Chambers' generosity was complimented.